There are a number of online retailers that offer chess sets at a relatively low price. One of the oldest shops in the business is Chess House. Known for offering a wide array of options for people on any budget, it is usually one of the first stops for any online shopper. So what chess sets are recommended in Chess House review sections? There are hundreds of options, but some of them definitely sell better than others. Here is a look at seven of the most highly rated chess sets out there right now available for purchase on the website. They are listed by category to give shoppers a much better idea on what to look for. In many cases, people are prepared to buy a certain type of chess set. Shopping within all the different categories is the best way to go if that is the case. Marble is one of the most durable materials used for chess boards out there. It can be a little bit on the expensive side, but a lot of people look at these types of boards as display pieces as well as being playable. The first thing any personal notice is that this is a very heavy set. Everything from the board to the pieces are very durable, but unfortunately it is not designed to be packed up and moved a lot. Each piece is made of natural stone that looks very elegant. The craftsmanship on the set is second to none. Even though a lot of effort was put into the set, it is still something that does not try to be too hard to be different. Instead, it opts to be a very classic take on the game of chess. This is a perfect option for someone who is looking to spend a little bit more money on a product that stands out. It certainly is not the cheapest, but it definitely can catch the eye of visitors. Sports fans tend to have an appreciation for the game of chess. Having a themed set can really be an enjoyable experience overall. Not only does it looked good in an office or at the local golf club, but it has enough durability to be played consistently. The chessboard is wooden, and solid all around. The extra amount of storage space beneath elevates the board a little bit. What is really the eye catcher though is the use of the pewter chessmen that are golf themed. It is really a pretty interesting concept, and all the pieces are very well done. It might take a little bit of time to remember exactly what each piece represents in a standard game of chess, but any golf fan is going to also be a fan of this set. The harsh truth is, chess is not really designed to be a mobile sport. There are so many different pieces to keep track of, and most are simply not designed to be picked up and moved around a lot. For those people who do a lot of traveling, there are specifically made travel chess sets to consider. Out of all the options on Chess House, this one stands out. Nothing is too crazy with this chess set, but everything is done very well. It is built with durability in mind, and the magnets help to keep organization strong as well. From the felt on the chessboard to the protective canvas case with compartments, it is easy to see that the extra effort was put in. For the price, it is really difficult to go wrong with this option. Anything cheaper than this really just feels like the quality is missing. Chess boards can get pretty costly in a hurry, but travelers should consider a cheaper option in case pieces go missing or damage is done. There is no sense paying a lot of money fro something that might be useless with missing pieces later. Simplicity is the name of the game with this board from Chess House. Anyone who closes their eyes and thinks about chess will more than likely picture a set that looks like this. When shopping for a classic chess set, it is important to not overlook quality. In fact, quality is the main reason why this one stands out amongst so many other options. Very rarely is it easy to find something that can look basic, but also provide enough elegance to be featured as a display piece. The chess board is made of mahogany and birch wood, and the pieces are high quality as well. Finally, the small amount of felt on each piece helps to protect everything and keep it looking as good as new. That is huge for anyone who wants to use it as a display piece when not actually playing. Yes, the price point is definitely going to turn a few heads, but the Man Ray Chess Set is a display piece that can grab attention almost instantly. The pieces are all unique, geometric forms. This set was created by Dada-Surrealist artist Man Ray, and it is essentially a work of art. Each piece has a story to tell as far as the design is concerned. Man Ray is considered by many to be one of the most innovative artists of his time. This is something that most people simply won’t find anywhere else. It can be played with, but the price and uniqueness of this chess set usually means that most people will simply display it like art. The good news is that there was no cutting corners with this set. Everything is done extremely well, and the pieces as well as the board has nice size to it overall. This themed chess set has a little bit of everything for shoppers. Not only is it made of durable metal that really helps to bring the gladiator team to life, but it is a 3D chess set as well. The base of the set can really capture the attention of people when displayed, but the craftsmanship on the pieces is what really makes this standout. Chess is often compared to contact sports, and being a Roman gladiator is about as contact as it can get. The entire set up tells a great story. There are actually quite a few themed chest sets available through Chess House, but this might be one of the very best. The cost is a little bit on the higher side, but the high-quality use of materials justifies it. For a modern look, there are a number of options through Chess House to consider. Some people think of modern sets as being very minimalistic. While there is some of those qualities with the Brass Art Deco Men on Red Grain Decoupage, the tall pieces help this set stand out. Each piece is solid brass, with a bronze and pewter finish. The pieces are on the taller side, with the king maxing out at 4″. The pieces stand up on a red grain decoupage board that is pretty glossy. A modern look for a chess board can really match up well with the right interior design. In fact, a lot of chess enthusiasts will shop for sets with their overall house look in mind. The durability is fairly strong with this set, but not the absolute best. Because of the price, a lot of people opt to only use this to play sparingly. There are cheaper options to go with for heavier use on a day to day basis. If a person has every researched buying a chess set online in the past, chances are they made their way to Chess House at least once. Known as one of the top places to purchase any type of chess set, the company has really taken off in recent years. 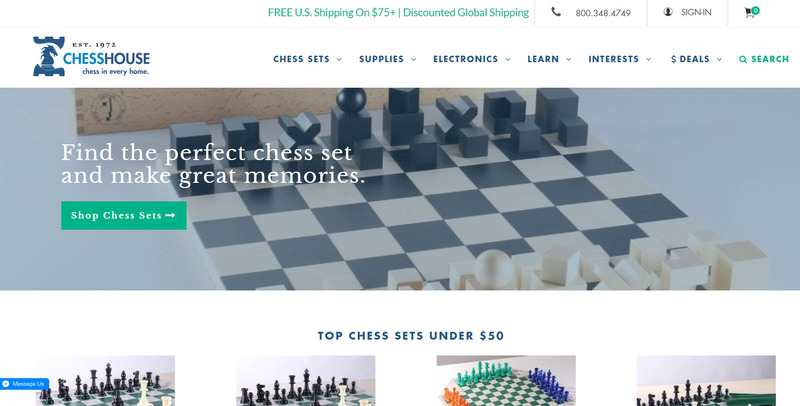 Established in 1972, Chess House stands by the motto of “make smart minds and great memories.” The company, based in Lynden, Washington, successfully made the transition from having a store, to mail order to online orders. They offer very affordable shipping options to compete with local stores. In some cases, they also offer free shipping for customers. Not only is the company focused on providing a lot of great deals when it comes to chess board options, but they are also committed to growing the game and enjoying the game. It is clear that they are very passionate about chess, and even talking to customer service representatives will make it clear that everyone plays the game. Since its launch, Chess House has focused on providing the lowest prices possible to stay competitive with other shopping options. It was important during the early years, but it is even more important online. Customers can take satisfaction in knowing that they have a best price guarantee for any option out there. 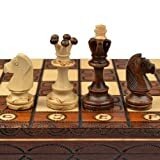 If a person is able to find a chess board for a cheaper price online from a reputable company, they can request a price match. This is very beneficial for shoppers, because they can get a cheaper price while also taking advantage of all the benefits Chess House provides for customers. Payment is easy according to Chess House reviews online as well. They except all the major credit cards, but what really helps them stand out is their use of PayPal, Amazon Pay and Apple Pay. For those people who simply don’t want to use new methods of payment, they still offer check and money order options. That only downfall to using older payment options is that Chess House will not ship a product until they receive it in the mail. Chess House offers a no hassle 90 day return policy for all of their products. It is one of the best return policies in the business, and something they take a lot of pride in. The only thing that they do not refund is the shipping charge, but that is standard procedure for most businesses. With no restocking fees, a person can even try out a chess board and see if it is the right fit for them. They will check to see if there was considerable damage or anything missing, but for the most part, returns will still be accepted. If at all possible though, it is always a better idea to not open anything before returning. Exchanging is another option for people who might want to get a chess board, but they just found the wrong option the first time. The exchange process is pretty much the same, but store credit is given instead of a refund to complete the deal. Simply put, Chess House has done everything possible to stay atop as far as chess shopping websites are concerned. Not only have they been around for a long time, but their customer service has continued to be second to none. They are constantly adding new inventory to their online store front, refusing to fall behind with the latest offerings. Even if a person doesn’t end up making a purchase from Chess House, they are worth checking out as an option. The company offers a lot of different things for shoppers to consider to take their chess board inventory to another level. With very competitive prices across the board, more and more people are making their website the first stop.